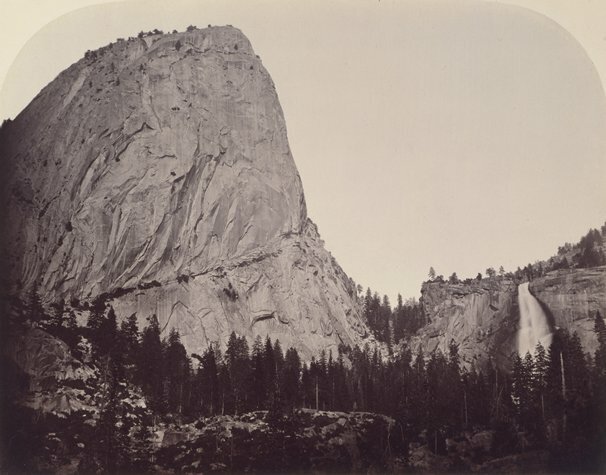 While Abraham Lincoln was dealing with the Civil War, Carleton Watkins was leading a mule train around the Yosemite Valley, photographing some of the most spectacular images ever made of the American West. In fact, some of those photographs helped convince Congress to preserve the Yosemite Valley. The bill that they passed was signed by Abraham Lincoln himself in 1864. Back in San Francisco the lavish Watkins Gallery at 429 Montgomery St. (later moved to 22–26 Montgomery) was one of the great wonders of the Barbary Coast. In San Francisco alone he photographed everything from the Mechanics’ Institute Library to the Palace Hotel to Telegraph Hill to the tall ships in the bay. He showed his large photographs, his stereo views, and his cabinet cards. He sold all manner of landscapes and street views right out of his shop. For many people it was their first glimpse of all the small towns and the mines and the farms and rivers and mountains and lakes of the West Coast. But the economy was being driven by things like the railroads, land speculation, mining, lumber, and other volatile commodities and unregulated industries. By the late 1870s Watkins became financially unstable and went deeply into debt. As a result his photographs were auctioned off and then ended up getting published without credit by Isiah Taber, among others. His images were so iconic and popular some unscrupulous photographers even rephotographed them and sold them as their own! Then, in 1879, the 50-year-old Watkins married his 22-year-old assistant, Frances Sneade (1856–1945), and had two children. With her in his life he seemed to bounce back, and did a number of ambitious photography projects throughout the 1880s and 1890s. But even then his fortunes didn’t last. By 1895 he became so poor that he and his family moved into an abandoned railroad boxcar for 18 months. To literally add insult to injury, his eyesight began to fail, and by 1897 the great photographer was almost totally blind. Nonetheless there was a glimmer of hope. Somehow he managed to sell his remaining archives to Stanford University. After so much bad luck he must have been really relieved to finally make some money. But then out of nowhere — and most importantly, before people from Stanford were able to pick up his archives — the San Francisco earthquake struck on April 18, 1906. The quake destroyed everything. His life’s work — mammoth prints, stereo views, cabinet cards, imperial plates, personal records, correspondence, and most importantly, his glass plate negatives — were all burned or shattered into millions of pieces. It was more than he could take. In 1910 he was broke, traumatized, and blind. With no one to care for him Watkins was committed to Napa State Hospital for the Insane. He died there alone in 1916. He was 87. Watkins was buried on the hospital grounds in an unmarked grave. There’s actually a photo of Watkins on the day of the 1906 earthquake…! Actually I like this photo. The early pictures that Watkins made of Yosemite represent an almost primordial wilderness which is to say, he is probably the first person to ever photograph these views. He also built his own camera, made his own photo chemistry and hauled it all up treacherous canyons on mules to get these images. The photo plates were on glass so they were extremely delicate and easily shattered. The amount of labor involved with composing the images and then coming up with pictures he liked was a long and exhausting process. To know all this and then to see the resulting images is to travel back in time. A picture tells a thousand words. I like it.